I caught this image over on Reddit, showing in “logo terms” how many of those small brands we know and love are owned by a select few corporate giants. We still have choices, but our money tends to go to the same few places. It reminded me of this slightly off-topic video showing snippets of the late George Carlin talking about the illusion of choice. We need more like him. It’s very interesting (if a bit scary) to see. But I wonder why is Lipton both in Unilever and Pepsico clouds. Unilever and PepsiCo join forces. And at least six of those 10 companies are owned by Monsanto. Hi Maria, good spot. Lipton is owned as a partnership and can be found under the brand sections of both the Unilever and Pepsico websites. 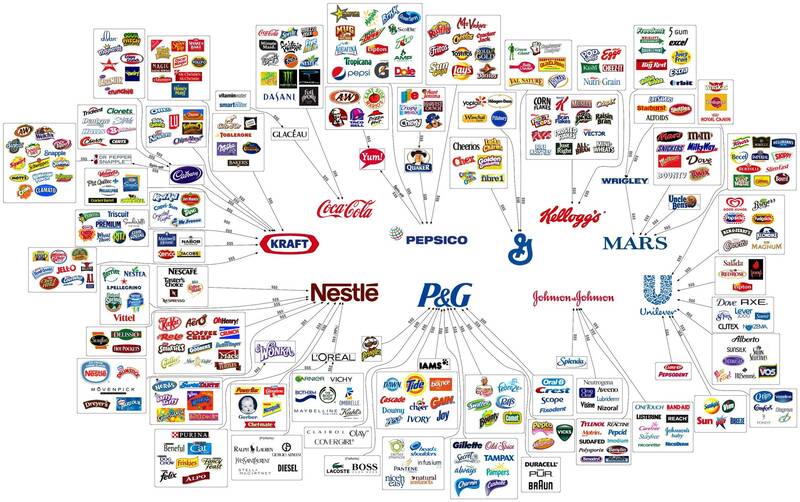 I’d be curious to know how many private label store brands are also made by these companies. I’m sure someone at some stage will expand this map because it could show a ton more logos — particularly ones that aren’t so US-centric. Laura, there’s always the image link, instead. Pepsi doesn’t own 7up, Dr. Pepper/Snapple does. They also have A&W in Pepsi’s restaurants instead of their beverages. I wonder how accurate the rest of this is. I knew it… this is called globalism and New World Order. Monsanto is the devil here. They want GMO to have food certified all over the world. Without certificates you will not be able to grow one potato! NWO BE GONE! In my country pepsi does own 7up, so maybe Dr. Pepper is from pepsico too? don’t know…. George Carlin was a champ. RIP. The A&W Restaurants are part of Yum Brand. I see the beverage has gotten farther and farther away from the Restaurant, but I think the restaurant still serves A&W Rootbeer even so. There are also plenty of American companies not represented on the graphic like Georgia Pacific and Kimberly-Clark. As well as some products missing like Eveready/Energizer which is owned by Nestle Purina. I’m sure this will be expanded a lot given time and a European version made as well. I believe Monster Energy is still owned by Hansen Natural, not Coca-Cola. It is distributed by Coke, however. Scary graphic. David, anytime you can work Carlin into a post, feel free. I love how he takes the PC sensitivity out of liberalism. And in case, if you folks haven’t noticed, monopolies and corporate diversification have a long history. That said, “local, handcrafted, homegrown, etc. etc.” is all the rage in many areas of commerce, so seek it out. You many not find it in automobiles and toilet paper, but often you can find better local options for your coffee, food, clothing and many other day-to-day items. The worst part about this is that these aren’t competing interests either. It’s an oligarchical monopoly. It’s nothing new. When I had my first job in an ad agency over 20 years ago I was astonished to find how many different high street store brands all fed back to the same holding companies. Shoe shops were particularly bad as I recall, just about all of them were ultimately owned by the British Shoe Corporation. I wonder why Nestea is both in Coca-Cola and Nestle. Dr. Pepper is a coca-cola product. Kind of frightening to see how small the “world” is. So Nestlé own diesel and Ralph Lauren…..really?? Crossovers are due to manufacturing, packaging and distribution. L’Oreal for example is one of the largest manufacturers of beauty products, but they don’t own everything they manufacture. Coka Cola bottles and distributes a lot of products they don’t outright own, as well. That kind of thing. I look at brand ownership a little differently. Coca Cola thinks they own Coke. But when they reformulate it for whatever reason they are confronted with an outpouring of rage, frustration, whatever, from the people who drink Coca Cola. So it turns out that while the company owns some of the intellectual property by which the brand is identified, users own a very important piece of the Coke brand – because without them the brand has virtually no value. The corporate folks who think they “own” a brand are only stewards who do their deeds at the sufferance of users. Consumers do indeed have a lot of power. However, the Coke example is not a good one. Coke used their brand to manipulate consumers into buying up all their old product by introducing “New Coke”. This allowed them to change much of the original ingredients of coke to cheaper substitutes. It was a manipulation of taste by forcing consumers to drink the sweeter new Coke or switch to sweeter competitors’ offerings so that when “Classic” Coke was reintroduced, the difference in taste from old Coke to the “Classic” would not be noticed. And it largely was not. I can think of many incidences where brands were used to manipulate consumers. I have to admire it when it is done well like the complex change over of a national brand from Datsun to Nissan, for example, that was done so well the average consumer didn’t even notice. And of course condemn it when done badly like when Tropicana dropped the graphic of the orange with the straw abruptly for a whole new look that consumers took umbrage to which caused them to change it back. The illusion is in the eye of the beholder. In general people will stick with a brand that is good for their current lifestyle and are not too concerned with who owns who. But it’s good to know. This is another way of 99% vs. 1%. Funny and ironic at the same time. The graphic doesn’t need it to make the point, but the Kraft section is missing all the Post cereal brands, which Kraft also owns. The tea brands, which are some of the oldest ones on the chart, appear in multiple places for different products: Nestea under Nestle for tea bags, but under Coca-cola for bottled/canned iced tea. Lipton tea bags (and spice mixes) by Unilever and Lipton canned/bottled iced tea by Pepsi. The Dr. Pepper and 7up brands have different owners and/ or licensees in different countries, and sometimes even different bottlers/distributors in different groups of states. These intricate licensing relationships could be one reason so many brands are now owned by intellectual property entities that only exist to own the brands, and then license them to all comers– from their former parent, to franchisees, to otherwise unrelated “extenders” of the brand (like the Diesel and Polo perfume examples on this chart). I stand corrected, by myself– Post cereals were sold off by Kraft to Ralcorp, who had ties to Ralston’s Chex brand (before it was sold years previously to General Mills). It’s a dark dark world. Do you want to contribute to the illusion by using your design skills for this type of work? Do good logos need to look good?